Something a tad different here from New York's PWR BTTM - no prizes for guessing how to pronounce that - with "Ugly Cherries", which is a perfect balance between raucous punk-rock and playful pop - not that horrendous Blink 182 kind of mix though. PWR BTTM consists of Liv Bruce and Ben Hopkins who are now on Father/Daughter Records, and the first thing that springs to mind looking up previous tracks and videos, is that they have a tendency for cross dressing, maybe not in the exact same musical styling as Ezra Furman, but they are reminding me of him right now regardless. "Ugly Cherries" is no messin', it's packed with flamboyant classic rock guitar riffs, and I'd like to say a catchy chorus but in reality every section is catchy. 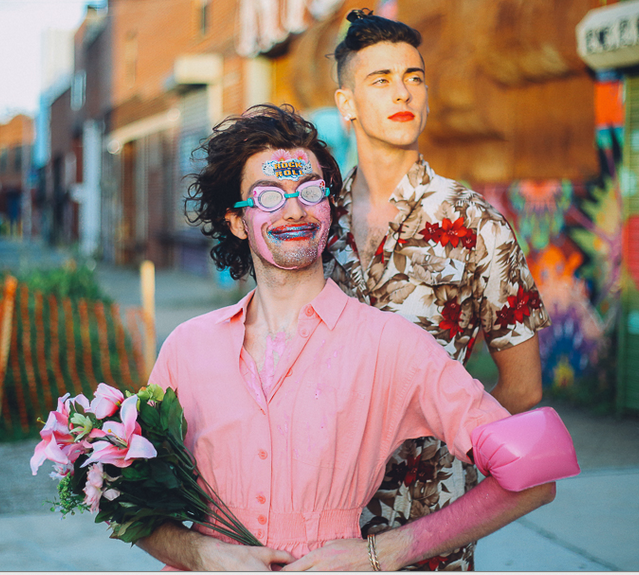 PWR BTTM are set to release their debut album Ugly Cherries on September 18th through Miscreant and Father/Daughter Records, so go grab a pre-order. Listen or watch "Ugly Cherries" below.